implementation of our goals. We are not done yet, and our plans for expansion are well under way. Our Grass Fed Operation has proven time and again that quality, taste, and tenderness take a dedicated plan. Not only the processing, which is done by local USDA inspected processing facilities and aging, but the types of feed our animals consume are of vital importance. We inter seed our pastures and hay fields with additional varieties of grasses and legumes each year. We also learn from our neighbors and contacts of many new veggies that are wonderful forage. Research is the key, learning all we can will result in a superior product. Working closely with our local FSA and USDA offices along with various inspectors also brings the behind the scenes information to us that is current and trustworthy. We are committed to our sustainable farming program for some very important reasons. The health of our land, herds and the nutritional value of what we produce. 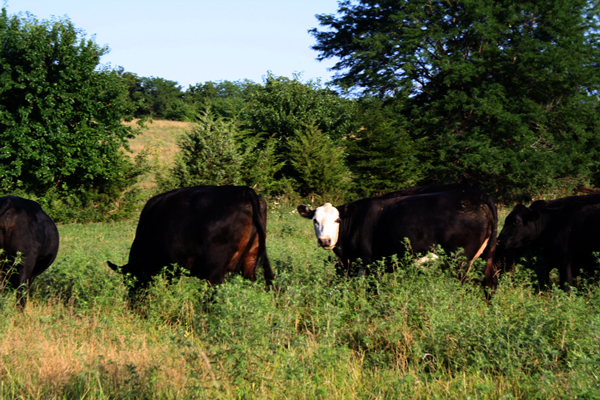 Northwest Missouri has long been the perfect place in the United States to raise beef. The gently rolling hills, abundant water supply, lush meadows and beautiful timber make this a heaven on earth for our cattle. Come on in, browse our site, maybe you have questions? Give us a call! All our animals are processed off the farm at USDA inspected facilities and transported with reputable delivery services with refrigeration. All meats are available at our retail spot in The City Market, Kansas City, MO. As we gain our rhythm with our new store LocallySourcedMeats.net we will be adding more here to update you all. In the mean time if you get a chance, come on down to The City Market in Kansas City, MO 64105 and visit us at 419 Main. We are excited about this new adventure and hope you will check out the link and come on down to the store.